Add a matching cabinet component. 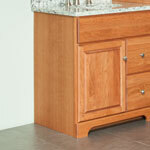 We state cabinet depth to the front of the doors, false fronts and drawer fronts as 21 3/4" or 18 3/4" deep. Maple painted cabinets have door panels and five piece drawer front panels of High Density Fiberboard (HDF) to provide a more stable panel. Solid Cherry, Cherry Rustic, Maple or Oak wood for Vanity - doors, drawer fronts, false drawer front, face frame, side moldings and top moldings. Solid Cherry, Cherry Rustic, Maple or Oak wood for Mirrored Cabinet, Framed Mirror and Light - doors, light front, crown molding, sill, side moldings and top moldings. Solid Cherry, Cherry Rustic, Maple or Oak wood for Linen Cabinetry - doors, drawer fronts, face frame, crown molding, skirt, side-moldings and top molding. Soft close fully-concealed European style hinges. Natural finish interior, shelves and drawers. Backs on dresser vanities, vanities, linen cabinets, mirrored cabinets and framed mirrors are 1/8" Maple laminate hardboard. Crown molding adds 1 3/8" to stated depth and 2 7/8" to stated width for Molding Overlay Construction. Crown molding adds 5/8" to stated depth and 2 7/8" to stated width for Overlay Construction. 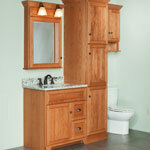 4" dividers included on vanities with doors and drawers. Ends of Cherry, Cherry Rustic, Maple and Oak 1/2" veneer core plywood includes a smooth and voidless MDF cross band next to the face and back veneers which improves the veneer surfaces. 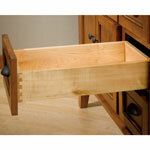 English dovetailed, solid 5/8" Maple wood drawer boxes with 5-piece construction. Tandem full extension, undermount, soft-closing drawer glides (or Equivalent). Drawer bottoms are 1/4" birch veneer plywood. The crown molding sub-assembly is shipped inside the cabinet ready to install with instructions for easy assembly. Door hinges are concealed soft-close with 108 degree opening. Shelves are made of 1/2" Birch veneer core plywood with a Birch strip applied to the front edge. Linen Cabinet (86 1/4" tall with crown molding) has 2 fixed shelves and 3 adjustable shelves. LB - Linen Utility has 1 fixed and 3 adjustable shelves. LC/LJ - Linen Cabinet has 2 fixed shelves and 3 adjustable shelves. 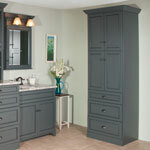 LD - Linen Cabinet has 1 fixed shelf, 2 adjustable shelves and 3 drawers. LF - Linen Cabinet has 1 fixed shelf, 2 adjustable shelves and 3 drawers. LH - Linen Hamper has 2 fixed shelves, 2 adjustable shelves and 1 roll-out hamper. 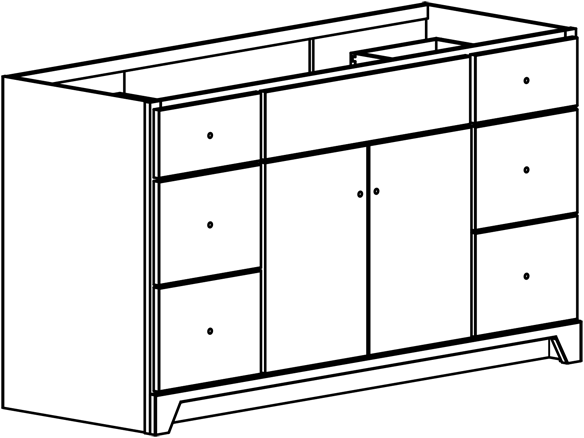 Dimensions do not include crown. 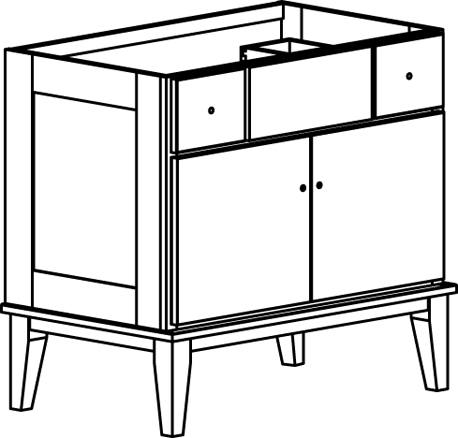 Drawing represents this model's configuation but may not be for the exact width, door style or trim. To order this model, take a print of this page, along with your Door Style and Wood-Color Selection, to your local Showroom (see Dealer Locator to select a Showroom in your area). 6 3⁄4"9 3⁄4"12 3⁄4"15 3⁄4"18 3⁄4"21 3⁄4"24 3⁄4"